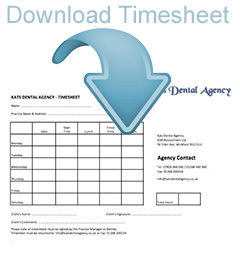 You can download our timesheet for submission here by clicking on the image or here. KDA currently pay their temp staff on a fortnightly basis on a Friday, always a week in arrears. All timesheets must be signed by a practice manager and submitted to KDA by the end of every week, any timesheets not received at least 3 days before payday will not be put through until the next pay run. KDA Temporary Dental Nurses code of conduct. Time-Keeping & Uniform: You must always arrive in advance of the job and be ready to start working at the time given. Lateness will not be tolerated. At all assignments your uniform, scrubs, tunic, trousers or dress must be presentable and clean . Uniform should only be worn at surgery not outside of clinical environment. Footwear: Shoes must be flat and fully closed in. Clogs or Shoes can be black, brown, navy (no multi coloured) and a flat heel. Trainers are only permitted if they are very plain and clean. Hair: Hair styles and colours must not be extreme or unusual and must present a professional image at all time. Hair must be clean and tidy and if long hair to be tied back. Make up & Jewellery: This should be kept at a minimum. No Jewellery apart from wedding rings, ear rings, only small studs. No dangling or hanging earrings are allowed . Visual piercings are not allowed. Nails should never be painted. Personal Hygiene: Please ensure that you appear fresh every day you are on duty. Smoking: Smoking is only permitted outside the surgery or in a designated area. Eating: Eating is not permitted whilst on duty. Gross misconduct during an assignment or failure to report for an assignment will result in loss of wages and you will be summarily removed from our placement listings.